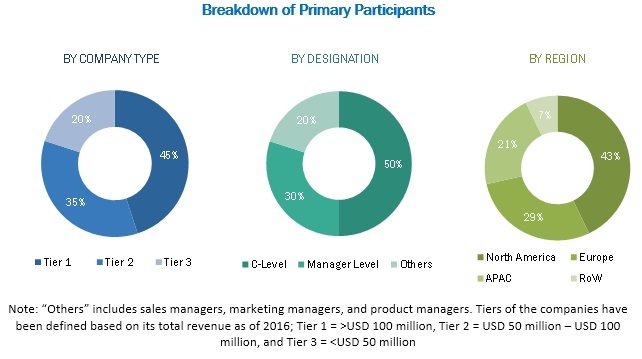 [148 Pages Report] The overall air separation plant market is expected to grow from USD 4.12 billion in 2015 to USD 5.52 billion by 2021, at a CAGR of 5.0% from 2016 to 2021. Air separation plants are used for the purification of various components of air, in particular oxygen, nitrogen, argon, and sometimes, other rare inert gases. For air separation, effective sizing and selection is always a combination of analytical modeling and empirical observation. The global market for air separation plants is driven by some basic factors that include strong growth in demand, especially in iron & steel, healthcare oil & gas, and other sectors. The base year considered for the study is 2015, and the forecast has been provided for the period between 2016 and 2021. Regulations concerning industrial gases are stringent owing to their flammable, corrosive, and explosive nature. Most gases are stored at specific temperatures to prevent explosion or leakage. Regulations regarding manufacturing, storage, and transportation of gases affect the market directly. Enforcement of policies and regulations by governments for safe working conditions in industries is the key factor driving demand for air separation plants globally. Many governments implement stricter norms to reduce the number of gas leaks and improve safety measures. The U.S. EPA is mainly concerned with the emission of harmful gases in the atmosphere that can affect health of its citizens. Gases such as CO, NO2, O3, PM, and SO2 are hazardous to humans. Initiatives such as the Clean Air Act and its Amendments and Air Toxics Rules and Implementation are some of the steps taken to improve the environmental conditions in the U.S.
During this research study, major players operating in the air separation plant market in various regions have been identified, and their offerings, regional presence, and distribution channels have been analyzed through in-depth discussions. Top-down and bottom-up approaches have been used to determine the overall market size. Sizes of the other individual markets have been estimated using the percentage splits obtained through secondary sources such as Hoovers, Bloomberg BusinessWeek, and Factiva, along with primary respondents. The entire procedure includes the study of the annual and financial reports of the top market players and extensive interviews with industry experts such as CEOs, VPs, directors, and marketing executives for key insights (both qualitative and quantitative) pertaining to the market. The figure below shows the breakdown of the primaries on the basis of the company type, designation, and region considered during the research study. The air separation plant market comprises a network of players involved in the research and product development; raw material supply; component manufacturing; distribution and sale; and post-sales services. 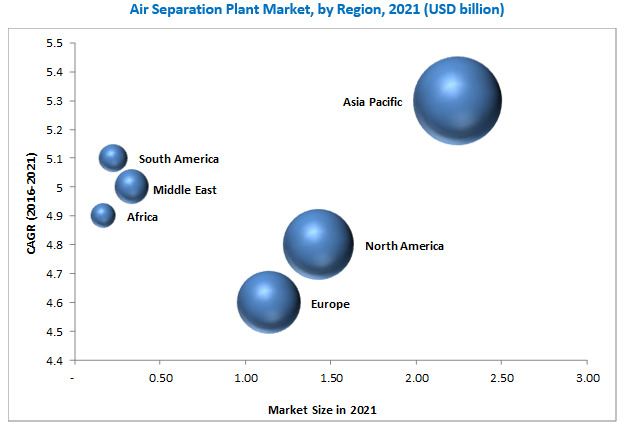 Key players considered in the analysis of the air separation plant market are Linde AG (Germany), Air Liquide S.A. (France), Praxair, Inc. (U.S.), Air Products and Chemicals, Inc. (U.S.), Taiyo Nippon Sanso Corporation (Japan), and Messer Group GmbH (Germany). In October 2016, Praxair announced the start of its second air separation plant of 1,300 TPD in Port of Antwerp and the extending of its pipeline system in the Port of Antwerp, one of the world’s largest petrochemical production complexes. The new facility also produces liquid oxygen, nitrogen, and argon to meet customer demand in the pharmaceutical, chemical, glass, metal fabrication, manufacturing, and food & beverage industries in Belgium and the Netherlands. In September 2016, Linde AG and U.S. rival Praxair Inc. confirmed they are in preliminary merger talks for a deal to create the world’s largest industrial-gas supplier with a potential market value of more than USD 60 billion. In October 2015, Praxair announced that it would upgrade its air separation liquefaction capabilities in the Salt Lake City, Utah area to meet demand in the region. A new liquefier will be added to Praxair’s plant, to nearly double the production of both liquid nitrogen and liquid oxygen. The project is expected to be completed in the first quarter of 2017. The overall air separation plant market is expected to grow from USD 4.12 billion in 2015 to USD 5.52 billion by 2021 at a CAGR of 5.0%. Stringent safety and environmental regulations, Growing demand from healthcare sector, increased demand for photovoltaic products and plasma display channels, and growing industrial development activities in Middle East & Africa are the key factors driving the growth of the global market. Air separation plants are used for the purification of various components of air, in particular oxygen, nitrogen, argon, and sometimes, other rare inert gases. For air separation, effective sizing and selection is always a combination of analytical modeling and empirical observation. Product innovations and technological developments for air separation process are expected to create strong investment opportunities in the market. The segmentation considered for this report is based on the air separation process, gas, end users, and regions that constitute the key markets. The air separation plant market has been segmented, on the basis of gas, into nitrogen, oxygen, argon, and others. The nitrogen segment is expected to grow at the highest CAGR between 2016 and 2021. Nitrogen is the largest and the fastest-growing gas segment of the global air separation plant market. Air separation plants produce nitrogen gas, which finds application in chemicals, metal fabrication, and oil & gas extraction, among others. On the basis of process, the air separation plant market has been segmented, into cryogenic, and non-cryogenic. The cryogenic segment is expected to grow at the highest CAGR between 2016 and 2021. Cryogenic is the largest and the fastest-growing gas segment of the global air separation plant market. Cryogenic is a preferred process for producing very high purity oxygen and nitrogen. On the basis of end-user, the air separation plant market is segmented into iron & steel, oil & gas, chemical, healthcare, and others. The oil & gas segment is expected to grow at the highest CAGR between 2016 and 2021. The iron & steel segment is the largest end-user of air separation plant. Air separation plant are used across various applications in the electronics industry, such as oil insulation, capacitor and transformer wrapping or insulation, magnetic wire insulation, and in gold leaf masking during wave soldering. The iron & steel industry depends on air separation plants to meet their industrial gas requirement. The iron & steel industry uses large quantities of oxygen, nitrogen, argon, and hydrogen and a small but growing amount of CO2 during processes/ operations. The air separation plant market in Asia Pacific is expected to grow at the highest CAGR during the forecast period. Growth in Asia Pacific is supplemented by the expansion of the metal fabrication industry, growth of the chemical and electronics sectors, and the developing healthcare facilities in emerging economies such as China, India, Malaysia, and Thailand. The iron & steel industry depends on air separation plants to meet their industrial gas requirement. The iron & steel industry uses large quantities of oxygen, nitrogen, argon, and hydrogen and a small but growing amount of CO2 during processes/ operations. The oil & gas industry depends on air separation plants to meet their industrial gas requirement. It uses industrial gases for oil recovery, pipe laying, inerting, and leak testing, among others. The chemical industry depends on air separation plants to meet the industrial gas requirement. In the chemical industry, industrial gases are used for pressure transfer, blanketing, and inerting, among others. The healthcare industry depends on air separation plants to meet their industrial gas requirement. The healthcare industry requires gases such as nitrogen and oxygen to preserve vital blood & tissue, helium for MRIs, and oxygen and respiratory therapy gases for breathing. What are the upcoming industry applications for air separation plant? Technical and cost factor is a major factor restraining the growth of the market. Though the air separation plant market is expanding at a good pace, it still faces some restraints. High energy consumption, sensitivity to environmental conditions, improper component selection, poor maintenance, high cost, and difficulty in fabrication are some major problems in some plants. Key players in the market include Air Liquide S.A. (France), Linde AG (Germany), Praxair, Inc. (U.S.), Air Products and Chemicals, Inc. (U.S.), Taiyo Nippon Sanso Corporation (Japan), and Messer Group GmbH (Germany). 12.4 Air Products and Chemicals, Inc.
12.7 Universal Industrial Gases, Inc.
12.10 Yingde Gases Group Co., Ltd.